An electronic kitchen scale with a high-precision strain-gauge weight sensing system, digital 0.4"H LCD display, Imperial/metric conversion switch, low battery indicator, and auto shut-off. A simple-to-use tare system allows you to deduct container weight and quickly zero out for multiple ingredient measuring. Weigh directly on the platform or use with a bowl. 5 lb/2 kg capacity with 1/8 oz/1 g precision for weights up to 2? lb/1 kg and 1/8 oz/2 g precision for heavier weights. Includes replaceable long-life lithium batteries. 10 year guarantee. English manufacturer Salter understands that the best cooking requires impeccable standards in precision. A slight measurement difference between two and four ounces of minced jalapeno pepper in a recipe can mean disaster. To avoid such mishaps, Salter created this microtronic scale. With its compact size and simple design, users profit by easy storage whether on a countertop or a drawer. It was great while it worked, but it only worked for a year. No explanation. It's a fine little scale. Great Kitchen Scale for the price! This scale was a great buy for me. I paid 30 dollars for it and that was a great price for what I use it for. I am a bodybuilder and nutrition buff and when I decided to beef up my nutrition plan by monitoring my food intake more closely, I chose this kitchen scale. The reason I chose the scale is because of it's ability to weigh and tare up to 5 lbs. The scale is not 100% accurate, as it is 30 dollars, but it is VERY close. a 1-2g margin for error is not that much, when you are weighing foods for calorie or sugar content. Also, I love that I can place my blender on the scale, nearly full to the brim of fruit, and still tare and weigh more. I find we are weighing more now than ever before. With this handy scale right on the counter, it makes it easy to keep our portions in line. Great for the teenagers learning how to cook and not being able to tell what the measurement is just by looking. So far we haven't found anthing we don't like about it. We have used this scale for several years--It's been great for weighing mail for postage, for weighing clay in the studio, and for weighing food. I broke my first one, either by putting something way too heavy on it, or when it dropped off the counter. But I have loved it so much, I am reordering the same scale again. Perfect except . . . 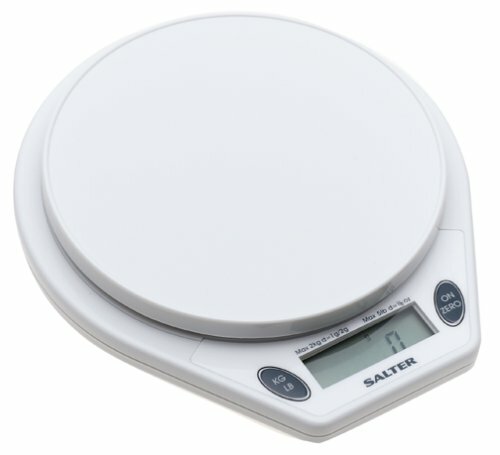 I love my Salter scale and highly recommend. As others have said, it is compact, easy to store and to operate. I've been using for almost three years and have not had to replace the battery. Quit working after six months!!! I was using a cheap dial scale for a few weeks, and leaning down each time to see if I was at one or two ounces was very frustrating. I love this scale because there's no question if I'm at 1 oz or 1 1/4 oz. It give a very precise measurement. I also love that you can zero out the scale. I use this feature all the time, especially when making salads or wraps. It saves me extra dishes that I was using to measure each ingredient. Instead, after I add the turkey, I zero it out and add the cheese. It's so simple a child could do it. It's very helpful since I've been doing Weight Watchers and am trying to really watch my portion size and be aware of how much I'm eating. The sleek and small design is perfect. I hang it on a nail under my cabinet in the keyhole in the back of the scale so it's easily accessible but out of the way. A little too helpful. . . I love this compact, flat little scale. Living in a very small city apartment with a tiny kitchen, I hang the scale on the wall when I'm not using it -- it has a key-hole shaped hole in the back so it goes right on a wall hook. That keeps it where I can find it in an instant and its low profile means it doesn't protrude when hanging. Especially great is its simple control design. One button turns it on and zeroes it out. I can put any container on it, such as a bowl, a cup, a measuring pitcher, or a sheet of waxed paper or a paper towel, press the on/zero button and then add the ingredient I'm weighing until I get the desired amount. One thing I really like is the other button that toggles between grams and ounces. These days, nutrition information on foods is given in set portions on the package -- and the portion size is always accurately given in grams. Therefore, when following the Weight Watchers program and I've decided how much of some dry ingredient I want to consume, I can determine the portion size in grams and weigh it accurately. That's true for something like a frozen dessert -- the weight of a portion of ice cream, for example, reduced fat or otherwise, is easy when spooning it into a bowl on this scale, but to measure 1/2 cup by volume is difficult, and approximate to begin with. Some other, similar, scales, have a grams/ounces slide switch on the bottom and that makes switching back and forth between grams and ounces a chore. This one does it with one touch. With recipes, if the weight of dry ingredients is given in ounces or grams, it's way easier and more accurate to weigh them than to try to measure them by volume and this scale makes that process a breeze. This scale also works perfectly for weighing outgoing mail to determine extra postage. The scale has a time-out feature that turns it off after a short period of non-use. So you don't have to turn it off when you're done -- in 30 seconds it will shut itself off. If you're weighing some ingredients, each addition of weight will keep it on, so rarely will it time out during use. Battery life is lengthy -- I've had mine for almost two years and the batteries are still working. I use it all the time and couldn't be happier with the product. Digital kitchen scales are kind of like microwave ovens - once you experience them, you'll never be without one. And when this particular one is working, it's a wonderful thing. But I found it to be rather touchy. You must be very careful not to bang it around on your counter while using it - mine eventually went belly-up due to a drop of 8"! God forbid you should drop it on the floor. That said, mine did last the better part of two years, which I suspect is well above the average life, and that's just not right. But if you buy one of these, I'd advise that you not expect it to last a lifetime, or spring for a sturdier model. Perhaps the bugs have been worked out by now, and the technology improved - just be forewared, this is a fragle device! The scale is light and won't take much space.